Alexander Kramida (center) talks with Montgomery College students Thomas Carpentier (left) and Eric Carpentier (right). 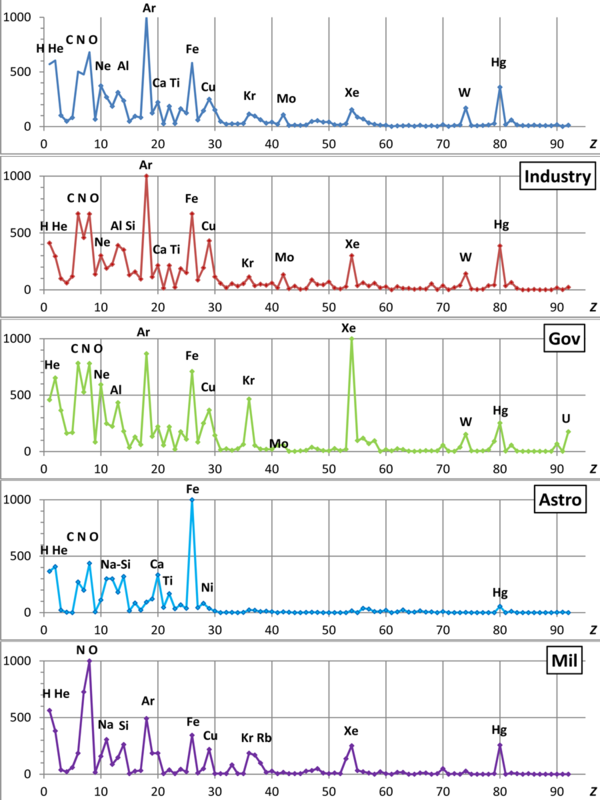 The online Atomic Spectra Database (ASD) provides the most authoritative information about atomic spectra available anywhere, and it is used by researchers worldwide. But how wide, exactly, is that world? What elements and wavelengths are in highest demand by different groups? And how can the ASD better serve its user community? Those questions are now being answered in detail by a new software tracking system, installed in November 2011, which records user request parameters such as element and wavelength, as well as IP address information. A just-completed first analysis of those requests has revealed numerous unexpected insights into user preferences and needs, including a surprisingly large interest in far-infrared (FIR) wavelengths, and unanticipated similarities between searches initiated by academia and industry. "Previously," says Yuri Ralchenko of the Quantum Measurement Division's Atomic Spectroscopy Group, which maintains the ASD, "we had only very general usage data showing the number of users per month steadily growing. But starting last year, we just felt that we needed more detailed statistics about how the database is being used. So we developed software for that. Each request now generates a specific entry in a separate statistics file. By October of this year, we had accumulated enough statistics for an initial in-depth analysis." Distribution of 21,051 users for which country of origin is identified. At this stage, says the spectroscopy group's Alexander (Sasha) Kramida, who authored the analysis, "only about half of our users can be identified fully. Future software will improve on that. But with what we have, it is possible to track a number of highly informative variables that will help us ensure that users get maximum utility from the ASD." During the study period, 306,488 queries – about 1,200 per day – were entered into ASD's online request form and logged in the tracking system. Of those, Kramida discarded 68,150 because the requests were defective, incomplete, or otherwise flawed. The remaining 238,338 usable requests were analyzed, and grouped into various categories. Of the usable requests, 49% came from academic sites, including international agencies and foreign institutions for fundamental research. 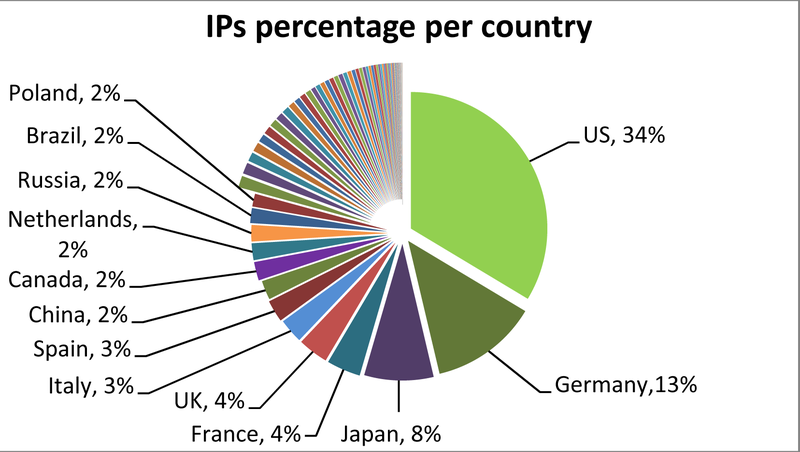 Another 41% were from unknown origins or from internet service providers (ISPs) or hosting companies, and thus could not immediately be assigned to a user category. Seven percent came from industry, 2% from U.S. government institutions, and smaller shares for astrophysics researchers and U.S. military research institutions. 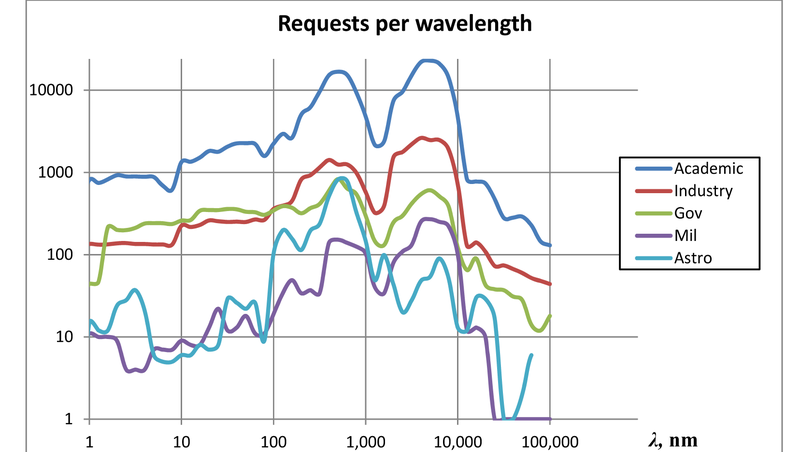 Number of requests per wavelength for specific user categories. For users arriving from ISPs, 60% were likely from academics or industry, 31% from the military, and 8% from astrophysics. For the unresolved IP addresses, 87% fit the academic/industry profile, 13% the military profile, and 0.4% the astrophysics profile. "But the biggest surprise in the study," Kramida says, "was the remarkable level of interest in the far infrared spectral region. Fully 47% of all our requests are for the region from 2 to 10 micrometers, and yet that range makes up only 5% of the stored lines in the ASD. [See chart, above left.] That's a severe deficiency. As it is, we were already planning on creating an infrared database for astronomers, who only make up 6% of our users. But now that we know these wavelengths are also important to many others, we'll probably modify the goals of that project." Kramida and Ralchenko are not sure what the high FIR demand signifies, although Ralchenko notes recent interest in several applications such as thermal sensors for military use and detectors that monitor weather changes and temperature variations in agriculture. "Right now, we're at the stage of trying to figure out what is needed," he says. "We should get much more information from an online user survey that we are planning for next year." No matter what that survey finds, expanding the infrared spectral data alone is a major undertaking. The ASD contains "a marriage of theoretical calculations and empirical data," Kramida says, in which each spectral line is evaluated and validated by a rigorous process, and every number in the database is assigned an uncertainty. So although the FIR work will begin by collecting all the data on that range that exist, each value will be checked and, if necessary, compared to spectra generated in the Atomic Spectroscopy Group's labs as well as theoretical predictions. "That is what separates ASD from every other spectral atomic database in the world," Ralchenko says. "No other database has behind it such developed and complete scheme of data evaluation. To do that, you need an established program, long experience, and dedicated people. NIST is unique in offering that combination. If you ask 90-plus percent of atomic physicists in the world where they go first for spectroscopic data, they will say this database." Statistics of element-specific user requests by atomic number. The graphs pertaining to various user categories are normalized to a linear scale from 0 to 1000.